My name is Hayley and this site is first and foremost a hobby, an outlet for my creative impulses. I’m just your average person who loves to travel, albeit an activity that is limited to periodic bursts of anything up to a few weeks in length. I’ve dabbled with blogs before, focused as travel diaries for a couple of trips. I enjoyed doing them and was sorry when they came to an end, eventually concluding that I had to set up a more long-term endeavour. This will be an assortment of entries about past and present travels, the big stuff and the small stuff. While overseas holidays are the big highlights, especially when you live in a fairly remote outpost like New Zealand, I think it’s important to see the place where you live as well. So over time there will be plenty of NZ-based quick trips and events. The blog name is a reference to my height – which can make long haul travel very long indeed… I live in Wellington and work as an IT programme manager. The best thing about my job is that it funds this blog and the activities within it! About 30m underground inside the Vinh Moc tunnels in Vietnam’s demilitarised zone. Not one for small spaces, I was rapt to find this 6ish-foot high passage! 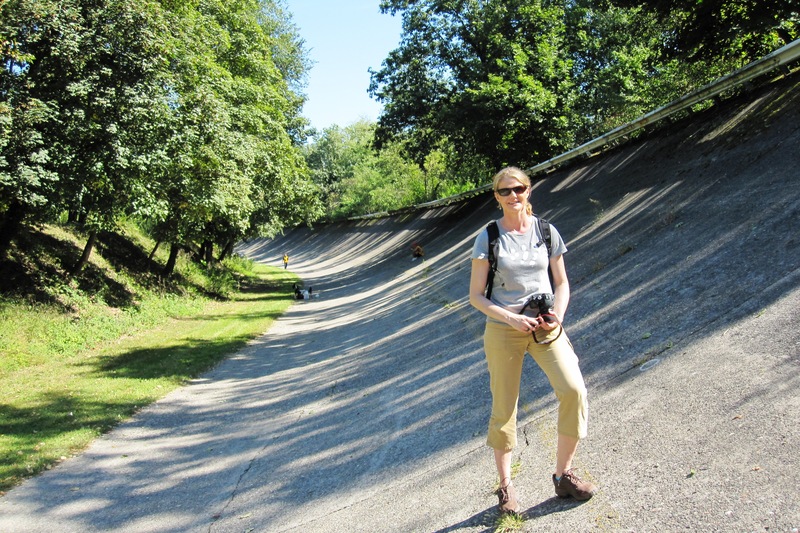 On the old banked oval track at Monza, Italy during the Formula One race weekend. Being here was a big personal milestone. I’ve nominated you for the “One Lovely Blog” Award! Check out my page for details – http://whereswiwi.com/2012/06/20/blogosphere-i-have-arrived/ I appreciate this award takes time and work so apologies if you have received something like it before, but I hope you take some pride in the fact that someone appreciates your work! Have a great day. Thank you so very much for the nomination Olivia! It means a lot. The thing I struggle with most in trying to honour the rules is submitting a list of nominees. Which suggests I need to put more time into building up my blog reading list! Anyway I hope to sort that out and accept your kind nomination soon. Congratulations on your award, your blog is indeed lovely – and maybe I’m a touch biased since we seem to have a similar aesthetic going on! Spouse and I live in a fairly remote part too—close enough to be exactly midway twixt pole and equator, yet able to say that further souther of us be only pengoons, open icy waters and the odd Greenpeacer. Enjoy your travels~! Hi Amit – thanks very much. We did ‘meet’ earlier as I donated to your Camino campaign a little while back – easy to lose track of people though in this virtual world! I’ll be following your journey with interest. oops, sorry! but you’re right… 😉 thnx again for your support! So you decided to join the small clan of Uncle Spike followers Hayley…. That makes me a happy blogger now – I really appreciate you making that special mouse click. Thanks so much for dropping by “Honey.” We visited the South Island a few years ago. Loved it. I love following your blog Hayley! I am addicted to traveling and taking photos of all the places and things I experience and I love that I can travel with you through your lovely blog and beautiful photos!! Thanks so much Janaline! I just wish I could get away more often. I’m often envious about the amazing diversity and experiences of your travels! So nice of you to say, thank you. It has its advantages! Perhaps not when it comes to buying clothes and shoes though 🙂 – thanks, Ralph. I agree. I used to be able to get shoes and slippers my size everywhere and nowadays, nowhere except on the internet. I can still get clothes though. Oh thanks for the follow just now. I can not find the comment section for the pics of Beijing. Maybe you have them turned off but these are really good and so interesting. Good for you! Love that you travel. If you’re a blogger chances are you’ll have come across awards where bloggers are nominated by their peers for various nice reasons. They have a ‘chain letter’ element as the recipient is asked to nominate others, and on it goes. I’ve been an occasional recipient, a bad one as it turns out as I’ve never participated. However, I am about to partly change that as Chloe from https://itstartedinoxford.wordpress.com/ has bestowed upon me the Liebster Award. By way of background I think this was originally intended for new bloggers as a way of boosting their profile; I on the other hand have been doing this for four years and don’t have the capacity to seek let alone maintain a higher readership. But such nominations are a nice consideration and acknowledgement and in the spirit of that I’ve decided to partly participate. I’ll answer the questions Chloe has posed as part of the award, but I’ll do it here rather than in a dedicated post, and in another demonstration of making up the rules to suit myself, I also won’t nominate anyone else. Not because there’s no one worthy, but because I can only properly read and follow a few blogs, being the sort of person I am, I don’t want to impose the obligations of the award on anyone else. 1: Where is your dream travel destination? That’s hard, but in terms of expense and logistical effort, Antarctica. 2: Dogs or cats? Historically, cats. They make me a bit allergic though. Growing up on farms we had working dogs which weren’t really pets, but Dad’s last one retired with them when they left farming, he was lovely. 3: Do you have any hidden talent? I’ve struggled with this question for a number of reasons – perhaps we could extrapolate this and say my hidden talent is over-complicating the simple? 4: Can you speak any foreign languages? No but I’m starting to learn a bit of Polish ahead of my trip there later this year. 5: What is your favourite type of flower? Don’t really have one. I was fond of gerberas and chose them for my wedding almost 20 years ago, but that chapter of my life is ancient history so gerberas are a bit tainted now :). 6: Where do you see yourself in 10 years? I’d like to not have to work full-time to allow more flexibility for travel and doing things for my family. I’d like to be living (at least some of the time) somewhere near the coast or mountains. 7: How would you describe yourself in 3 words? Aggghh! I’m going to pass on this one. 8: Tea or coffee? Coffee. I should really quit but, well, coffee is my friend. 9: What are you currently reading? No books on the go currently but have just downloaded a couple as research for Poland. 10: What’s the first thing you see if you turn your head right? Our kitchen (and the pile of dishes waiting for me). 11: If you have any pets, what are their names? I haven’t had any pets since leaving home 25 years ago. When I was little, our cats were Snoopy and Snigglepuss. Your site is really interesting. Thanks for sharing and congrats Hayley! I work as a photo researcher for Fairfax Magazines in Auckland and it is possible that we might be asking your permission to publish one or two of the photos on this blog. In particular, I like the one of the boys at the greenstone Wall of Tears at the National Army Museum. Having said that, it all comes down to space available! In theory, would you object to us using one of your images in a publication called The Insider’s Guide to New Zealand and would you have the high resolution files available to send us? We would print your name as the credit for any pictures sent. Have you ever created a google layer for your shooting locations (with google my maps I think), which you could share? I’m particularly interested in street art locations in NZ as I’m visiting during the first couple of weeks of Feb ’16. I saw you had tagged street locations for some of your Wellington pics so I thought I’d ask. I used layers like these recently when wandering around Manhattan and Brooklyn. Hi – it’s a good idea, would be a great reference, but no I’ve not created one. Perhaps next time as I’m collecting notes of other locations to go out and photograph etc, though it won’t be before your visit. Make sure you go to Christchurch, some new murals are going up at the moment – check out the Facebook page ‘Oi You’. Hello! I nominate you for the “Best Photo of the Old Banking at Monza” award! I’m sorry there is no prize associated with this award. Just another blogger’s admiration (and mild jealousy)! Cheers! Sherry is planning to visit Kokoszkowy Parish next May. I would like to contact her with your Mum as she needs some some birth/marriage dates from the disk you got from Priest Marek. Her ancestors were the passengers Lewandowski, Kowalewski from the same boat “Fritz Reuter”. Will continue this on Messenger rather than here.